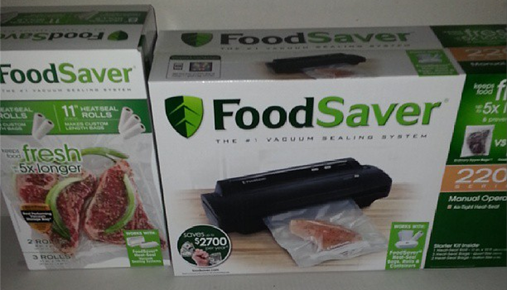 Review: I Got 80 Lbs of Chicken from Zaycon and a FoodSaver to Store it all! FoodSaver was kind enough to send me their FoodSaver model V2244 to review and I can’t even tell you how awesome it is. Dian and I just picked up 80 lbs of chicken from Zaycon and were planning to just throw it all in Ziploc bags but FoodSaver is so much easier to deal with. The first great thing about the FoodSaver bags is there is very little waste. You can custom cut your bags to the perfect size for whatever you are storing. No more putting a pint of food in a quart size bag or filling a bag and having a little left over. The second thing I loved was that it was very easy to know for sure that you have a good seal. Sometimes those Ziploc bags don’t close right but with FoodSaver, if something isn’t right, you know immediately. That means no more freezer burnt meat. I didn’t get to use it but there is also an accessory attachment for a vacuum hose, enabling you to use FoodSaver attachments for canning. There is also a “crush-free” setting in case you are sealing something delicate and don’t want to take all the air out of a bag. This is a fantastic device and is a worthy addition to our kitchen. It has already changed the way we store food and will save us money on food waste. Look here to get one from Walmart.com today! Disclaimer: I got the FoodSaver free to review. My opinions are my own.